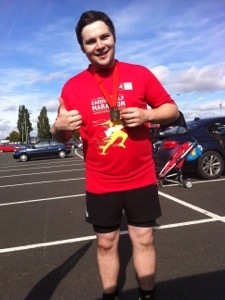 Cardiff Half Marathon | Today I Breastfed. On Sunday October 6th, Oliver ran Cardiff Half Marathon to raise money for Chester Milk Bank, which collects, screens and distributes donated breast milk to babies who need it. Donated milk saves the lives of babies. I donated to the milk bank myself. This entry was posted in Uncategorized and tagged attachment parenting, baby, breastfeeding, child, exercise, family, feeding, food, gentle parenting, health, marathon, mother, natural parenting, nurturing, Parenting, toddler by Today I Breastfed. Bookmark the permalink.